Maybe you love Siri. Maybe you don't. Either way, you probably want to know that, if you rock an iPhone 4S, you're probably using twice the data of someone with a humble iPhone 4. 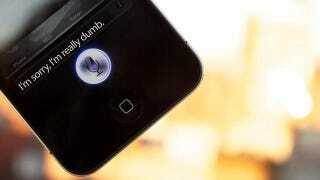 Bloomberg reports that the voice recognition software prompts users of the newer phone to use double the data of those stuck with its predecessor. Admittedly, Siri hasn't been around all that long, so this could be a result of the software's novelty factor. Asking it if it's pro-life, using it to find hookers. You know, the usual. Or, it could be nothing to do with Siri — but there's little else to separate the two phones, so let's roll with the theory. If you're on a limited data contract and either (a) haven't had a bill since your new phone arrived or (b) are dreadful at checking your phone bill anyway, you might want to check how much data you're using to avoid some big charges.